The coast of the British Isles provides countless opportunities for sea anglers. There are many species of fish to catch and the coast is open for fishing all year and it's free! Piers and jetties are ideal places for catching mackerel and codling. Mullet flounder and dab frequent estuaries and harbours. The foam covered seas next to rocky headlands are home to wrasse and conger eel and every beach offers the chance to catch bass, whiting and ray. 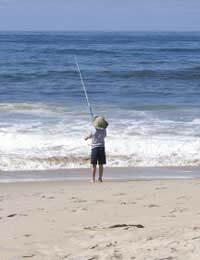 At most seaside resorts there are fishing trips available. These trips only last a couple of hours but they are a perfect chance to experience the thrill and enjoyment of sea fishing. Rods and bait are usually provided and the skipper of the boat will try to ensure that fish are caught. After all, he needs future customers. Many harbours have charter boats for hire. These boats sail along the coast for pollack, cod and flatfish. Some ports have boats that take anglers wreck fishing. It can be expensive to go wreck fishing but imagine battling against the strength and power of ling and conger eel. For the angler new to sea fishing, a general-purpose rod is the best choice. These rods are less than 4 metres long and are suitable for fishing from beach, pier and boat. Multiplier reels are used by anglers beach casting for bass and codling. Used by inexperienced anglers, multiplier reels have a tendency to overrun causing line to tangle. Fixed-spool reels are easier to use and are very popular with many sea fishermen. Put line of breaking strain 20lbs. on the reel and this will be adequate for most occasions. Choose a large, bright coloured float for float fishing so that it can be seen at distance and in the swell of the tide. The method of using weight to keep bait on the seabed is called legering. Legers (weights) come in different sizes. Try a leger called a bomb because they have a swivel to allow line to run free so a fish will feel less resistance when taking the bait. There are two categories of bait: natural bait and artificial bait. The tide line of our coast has an abundance of free bait waiting to be collected by the sea angler. Lugworm and ragworm are popular bait for catching many species of fish. They can be found at low tide in wet sand. Look for worm casts and blowholes that indicate where the worms are and then dig them out with a garden fork. Peeler crabs are found in estuaries at low tide and are excellent bait for flatfish and cod. Outcrops of rocks are covered with shellfish. Limpets, mussels and cockles are all worth trying. Mussels have a tendency to fly off the hook when they are being cast out. To prevent this from happening tie a piece of thread around the mussel. This is manufactured bait that is designed to resemble prey of predatory fish. Spinners are made from metal and are shiny and colourful. When reeled through the water the spinner will rotate and vibrate imitating a vulnerable or injured fish. Sets of coloured feathers are available from tackle shops. Jerk the feathers through the water and they look like a shoal of fry. Predatory fish such as pollack and mackerel will launch an attack at spinners and feathers. Take care when using sea hooks because some are made with sharp barbs on the shank and can be a nuisance when baiting up. Many species of fish swim closer to the shore when it's dark so night-time fishing is worth a try. Wear rubber soled boots when fishing from rocks. These places can become slippery with water and seaweed. If you use king ragworm for bait watch out because they have pincers that can inflict a painful bite!